Libya's government confined to outpost Jump to media player Libya's new parliament has fled to the eastern city of Tobruk after militias attacked the capital, Tripoli this summer. Briton held hostage in Libya freed Jump to media player British teacher David Bolam is released after being held hostage by militants in Libya, the Foreign Office confirms. Hunting for migrants fleeing Libya Jump to media player The growing instability and fighting in Libya, has turned the country into a major departure point for migrants who are hoping to reach Italian shores by boat. 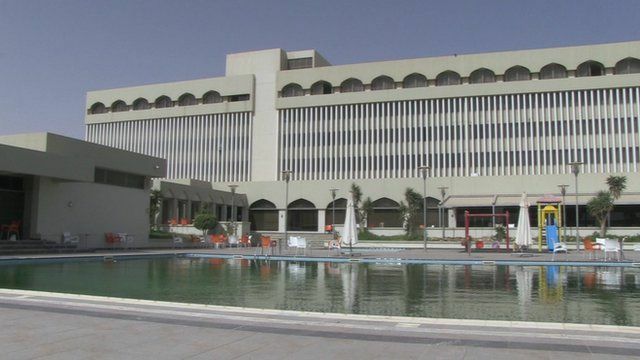 Libya militia take US embassy pool Jump to media player Armed militia have taken over the US compound in Tripoli and discovered the embassy pool, a month after American staff left for security reasons. US alarm at air strikes on Libya Jump to media player The US was "caught off-guard" by air strikes against Islamist militia in Libya, a senior official has told the BBC, as Rana Jawad reports from Tripoli. Three years after the revolution that drove Colonel Gaddafi from power, is Libya on the verge of becoming a failed state? The country's elected parliament was driven from the capital Tripoli earlier this year by militants and is now based in a hotel in the eastern port of Tobruk, from where it is desperately trying to hold the country together. Tim Whewell is one of the few foreign journalists to reach the city.